Jeff Lewis – Pride Houston, Inc.
Jeffrey Lewis, originally from Kansas City, MO, moved to the Houston area after completing law school in 2016. Jeff is passionate for being active within the community in which he resides. Examples of this include being an active member of multiple non-for-profit boards, volunteering with the Boys & Girls Clubs of Houston, Rodeo Houston, and recreational sports. 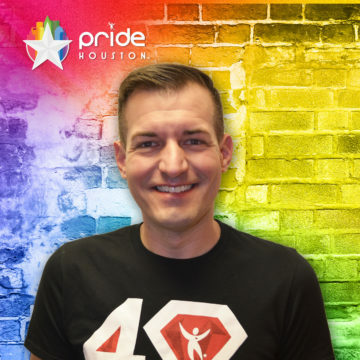 Jeff volunteers with Pride Houston as a way to give back to the community and those LGBT mentors and persons within his life that have shown him what it’s truly like and how to be an outstanding member of society. Pride for him isn’t about attending the festivals and events, it’s about working for the community and showing his personal pride for Houston and the LGBT community through hard work and dedication. When Jeff is not working as an International Account Manager at a local commercial insurance broker, you would find him traveling or at a local dog park with his beagle, Rylan. Jeff holds a Bachelor of Science from Missouri State University, an MBA from Baker University, and a Juris Doctor from Barry University School of Law.